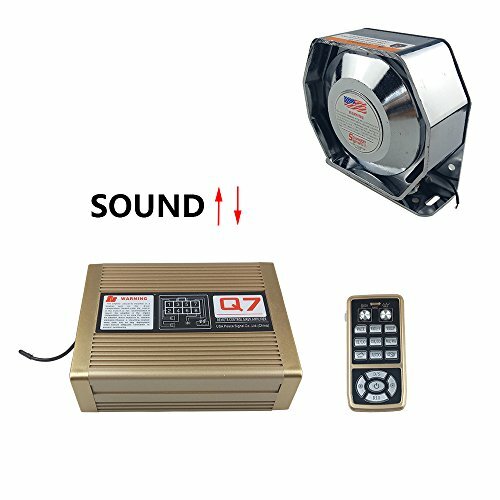 Features:- Universal 7 tone sound horn with wireless remote control for easy operation- Sound loud and clear, you can hear the tones clearly- Offers 7 great sounds: fire alarm, ambulance sound, police siren, traffic sound and so on- Easy to connect with 12V power source, include mount to install on any convenient places- Suitable for motorcycles, mopeds, non-professional police car, fire car, ambulance and other carsSpecifications:- Sound Level: 115-130 dB- Impedance: 4Ω- Voltage: 12V- Power: 100W- Overall Dimension(LxWxH): 6 5/16" x 4 5/16" x 6 11/16" (16x11x17cm)(16x11x17cm)Package Contents:- 1x Car Warning Alarm- 1x Wireless Remote Control- 1x ManualNote:- According to different legal and traffic rules, please follow your local requirements to see if you have the rights to use this horn speaker on the public road. Q7 Instructions for use： 1、Press and hold the ON / OFF key button to turn on the power,the backlight is brighting.Press again to turn off the power. 2、Press the whistle button(two round keys) to make a whistle sound,release stop.When the D/S reverb key is pressed, the whistle will become bass. 3、Other siren key, click Start.Press again to close. 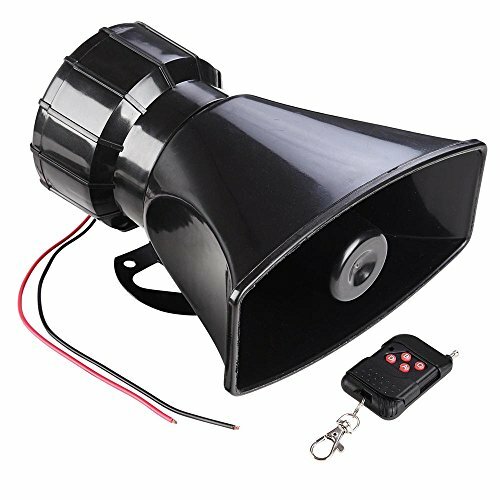 4、Lamp control I short press ,open the I way lamp control,press again to close.Press and hold to turn down the volume of the siren sound. 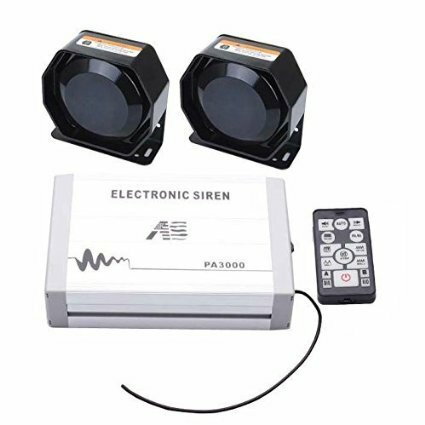 5、Lamp control II short press ,open the II way lamp control,press again to close.Press and hold to turn up the volume of the siren sound. 6、The RIO key turns all the sounds(Except whistle) into bass. 7、Mute key,stop all sirens. 8、Press the call key, and began to speak, finished speaking loose button. 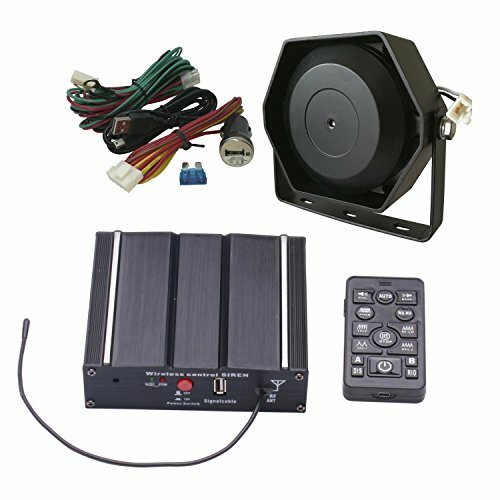 9、If the speech is not clear or there is noise, adjust the direction of the antenna on the host or charge the remote control, red light off on behalf of fully charged. Q7 Wiring Instructions： 1、Two green lines connect one speaker. 2、Black lines connect 12V power negative. 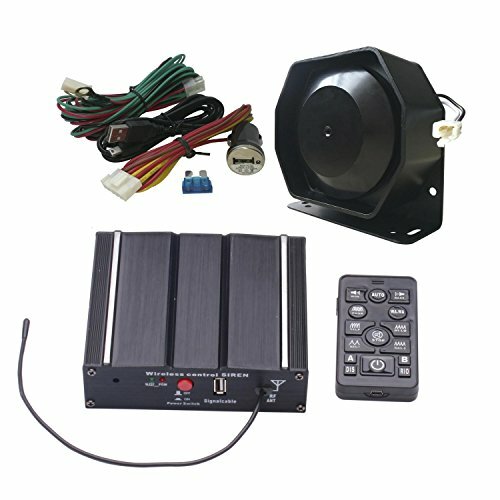 3、Red lines connect 12V power positive. 4、The yellow line connects the positive pole of the group A warning light. 5、The white line connects the negative pole of the group B warning light. 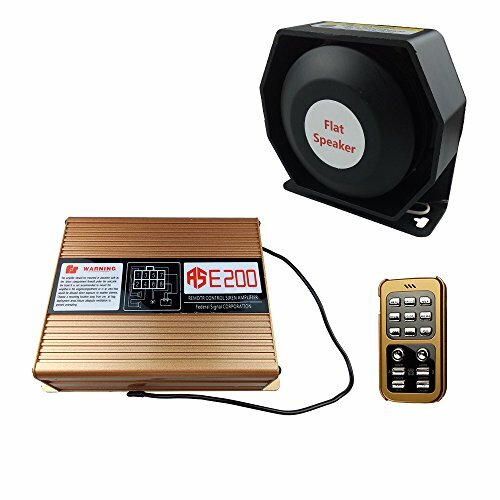 E200 Instructions for use： 1、200W (Actual output power: 150W) 2、12V 3、Remote control of the D / S button and RIO button can change the sound. (Upper part buttons converts the sound through the RIO...Two round buttons converts the sound through DIS) E200 Wiring Instructions： 1、Two green lines connect one speaker. 2、Black lines connect 12V power negative. 3、Red lines connect 12V power positive. 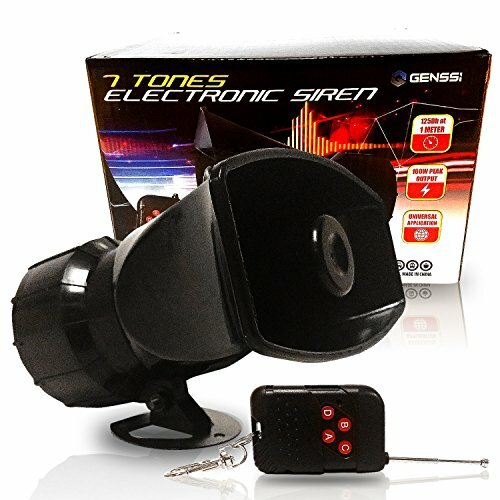 The next generational in GENSSI non-professional sirens that is 100% wireless. No more worrying about drawing wires through your firewall. 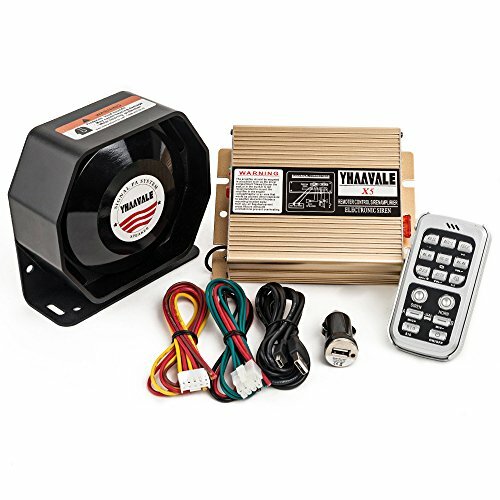 Simply find a 12V DC connection in your engine bay and wire your horn with 2 wires. Your wireless remote control will do the rest! 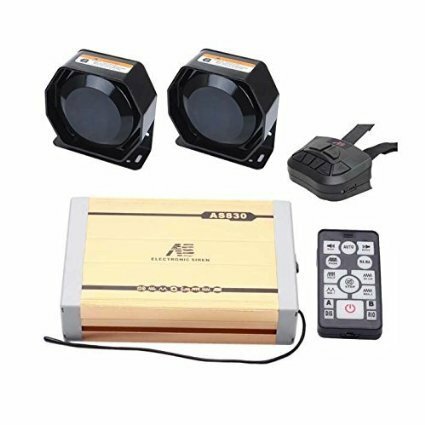 Wireless Remote controller 7 Tones 100W Peak Output 125 DB @1 Meter Universal application for car, truck, boat and fleet Instructions: Power siren with 12V DC or car battery Button A: 4 Tones, press to change tone Button B: Tone 5 Button C: Tone 6 Button D: Tone 7 Not to be used as a replacement for professional equipment sirens. Will not be as loud as regular police car sirens. This is designed for amateur use and/or for off-road play. Not to be used on the public road unless you are licensed and have rights to do so. Violation of your local state and federal laws are possible. 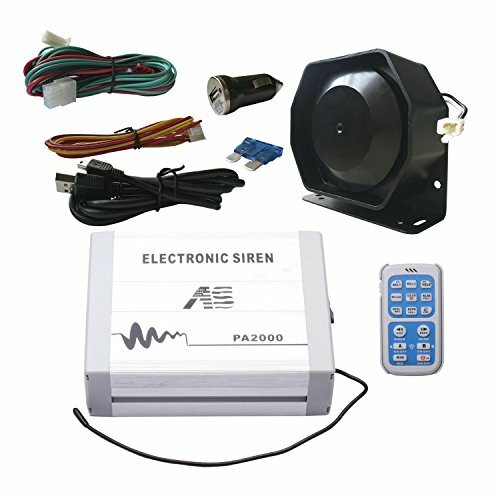 Compare prices on Police Siren Wireless at ShoppinGent.com – use promo codes and coupons for best offers and deals. Start smart buying with ShoppinGent.com right now and choose your golden price on every purchase.